Riots broke out in Ndola this morning after a suspected car thief who was being pursued by police lost control of the vehicle and ran over a street vendor, killing him instantly. Business came to a standstill as police fired teargas canister to disperse a mob of irate Ndola residents that had blocked all the roads in the central business district while burning tyres. 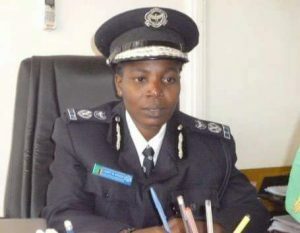 Explaining the incident to journalists, Copperbelt Province police commissioner Charity Katanga said the incidence happened around 10:00 hours when a car washer stole a vehicle a customer had entrusted him with and sped off. Katanga says due to over speeding, the driver identified as 23-year-old Benson Ngongo, lost control and hit into a boy who was selling eggs near Chisokone market, killing him instantly. She says some onlookers blamed the accident on the traffic offers that had arrived on the scene shortly after and begun rioting. “There was a riot between 11:00 hours and 13:00 hours as a result of a motorist running over a boy aged between 10 and 15 years old. What happened is that a car washer accompanied by another car washer decided to steal a vehicle that was entrusted to them and sped off. Due to excessive speeding, he failed to negotiate a curve and hit into the boy. So the traffic police who were nearby tried to take the body to the mortuary but the residents ran amok and that’s how the riot started,” Katanga explained. She added that the owner of the car noticed that strange people were speeding away with a car which he had asked the wife to take for cleaning. “It was a stolen vehicle and you will agree with me that people who steal motor vehicles drive very dangerously. The wife is the owner who was sent to go and have the car washed, so the owner of the car just saw his vehicle being driven by strange people at a fast speed,” said Katanga. Its got no substance .I doubt its coming from the police commissioner. Could be that they have just used her pic. Sad the boy lost his life. True no substance in the statement, just remove traffic police like Nigeria, this too much its high time they learn.